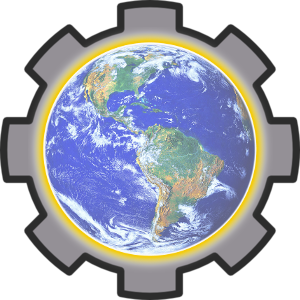 Gaia Confederation emblem. Simple but effective, if possibly a little generic and/or Amero-centric. Solar Council (Planetarist) emblem. Not sure if it works with the transparency. That's good in that it represents the entire Earth, but to be used as a symbol (or part of one) I reckon it would have to be scaled down and simplified into some kind of silhouette or outline, if you know what I mean? Here's a novel solution: animation! I do believe this is the very first animated image I have ever created. What do you think? Also, Mather tells me that "Terran Confederation" would be a better name. I chose "Gaia" on second thoughts and perhaps sometimes the second idea isn't as good as the first, although I suspect that Mather's preference is due to an aversion to the tofu and sandals brigade. Which kind of inspired my third idea for the name, the TechnoGaian Confederation. The addition of "techno" to the name makes sense given their adherence to Extropian thought and also acts as a stylistic flourish in the opposite direction to any tie-dyed implications. It could also be taken as reference to technogaianism, a "bright green" movement that advocates the use of emerging and future technologies as a solution to environmental problems. I always felt that "Gaia" was more tied to an explicitly environmentalist view point, where as "Terra" typically sounded more neutral and is more common in sci fi. I suppose it depends on how global this confederation should be. Red Commissar wrote: I always felt that "Gaia" was more tied to an explicitly environmentalist view point, where as "Terra" typically sounded more neutral and is more common in sci fi. I suppose it depends on how global this confederation should be. Well, it's certainly global in overall extent - I was thinking territory-wise that it would consist of at least all the 22nd-century Extropian polities on Earth sans Marispatria and maybe one or two other Extropian polities. I was thinking though that "Terra" has been used quite often in sci-fi, and I wanted something different. Talking with Mather again gave me another idea for a name - the Tellus Confederation. I like this name because it sounds "crunchy" and science-fictional without sounding too much like it's been done before. 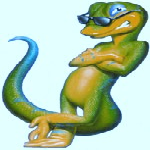 Although also I like the contrasting nature and bright green implications of the "TechnoGaian" third name idea. I like the Tellus Confederation, it sounds cool. As you may have gathered, my conception of mechs in Nova Mundi isn't like those Japanese super robot shows where the vehicles concerned are a brazillion feet tall, run around at the speed of light and are as nimble as a ballet dancer. Instead, I imagine Nova Mundi mechs to be generally no bigger than a smallish house, reach the same kind of speeds as an attack helicopter, and their agility to be inversely proportional with their size. So there's a basis for a three-way calculus where size (which decides how much weapons and armour can be carried), straight-line speed and agility are three basic properties of mech vehicles that have to be balanced in a certain way depending on the goals of the vehicle designer. Let's face it. Mechs are not entirely practical weapons of war. All the advances in electronics and materials that could make mechs possible (if not practical) as weapons, could easily be applied to make conventional tracked armoured vehicles that much better. Tanks and other armoured vehicles have a low profile for a very good reason - the power of modern weaponry means that standing out on the battlefield is a good way of getting destroyed in short order. Then there is the question of efficiency in volume usage; look at the above image and compare it to a tracked vehicle of the same volume, and you should notice that the proportion taken up by robotic legs is far greater than the proportion taken up by tracks and wheels in a conventional vehicle. These among other reasons are why mechs cannot simply be justified "as is" - there have to be wider reasons why such things are being built. This has implications for the weaknesses of mechs as a class of weapons - mainly that it is very bad for them to be out in the open, against a well-prepared and/or well-trained and equipped force. Mechs in the Mundiverse: three archetypes? The Raider design archetype focuses primarily on speed and agility rather than size (and hence firepower). The first example of this in Nova Mundi is the Cymek, developed in the early 22nd century by the Cameroon Pact as part of their arms development program, and illustrated above. The Cymek unit was deployed by the Pact against rebel units and outposts during Congo-Brazzaville's secession. Despite the wider geopolitical realities ensuring the rebels' success, the Cymek proved its worth as a flanking and harassing unit, and production continued throughout the 22nd century. In addition to a bio-electromechanically integrated transhuman pilot and agile drivetrain, the Cymek unit's manoeuvrability is further improved by a set of jump-jets, enabling to leap tall buildings and other large obstacles in a single quick bound. The Knight design archetype reflects a more individual combat ethos, being as much a display of martial status as a practical weapon of war. The above image shows a Super Heavy Battlesuit unit of the Ludorian Republic of Io, in the livery of the Blue Team. Although not as fast as a Cymek or as agile as a Berzerker-7, the Super Heavy Battlesuit makes up for it in firepower and combat durability. Standard features include an electrostatic shielding array in addition to jump-jets. 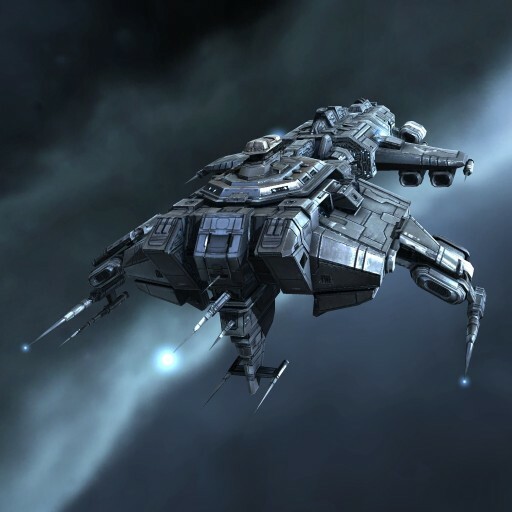 The Ludorians use such units to spearhead precision spaceborne assaults, with ground support provided by Espatiers and orbital fire support provided by Space Force units. 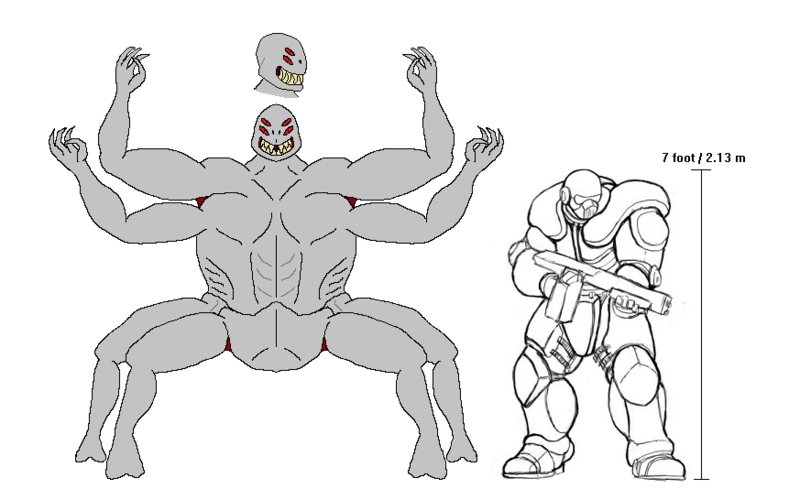 The primordial example of the Gladiator design archetype is the Berzerker-7 produced by the Warmachine of Mars in the early to mid 22nd century. This design had no crew, being controlled by a hard-coded AI programmed with a lust for combat, tempered with enough cunning to make them truly dangerous adversaries. 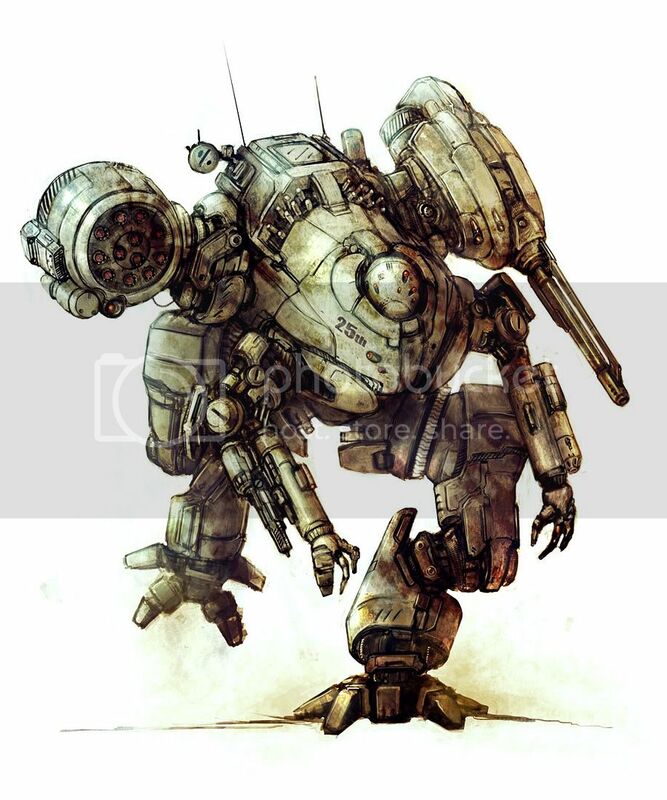 Without having to worry about an organic crew or pilot, the Warmachine's engineers were able to coax a truly bone-crushing amount of agility from this design, along with a powerful (some would say overpowered) plutonium-fuelled fission powerplant that could dispense with a great deal of heavy shielding. In order to further save weight for more weapons and armour, the engineers also dispensed with providing any reactor poison, meaning that destroyed or disabled Berzerker-7 units present a significant meltdown hazard. Advantages: Lower profile, greater leg redundancy (can hop better if a leg is shot off). Disadvantages: Increased complexity, even less volume-efficient than two legs. A further advantage to this design however is increased stability, assuming the full complement of legs is still present. This means that spider tanks can carry heavier weapons or those with greater recoil. Disadvantages: Lighter armament, lighter armour. The Battlesuit basically represents a sort of compromise between heavy infantry and mechs. Very effective against light and medium infantry and light armour, less so against heavy and super heavy armour. Performance against medium armour (MBTs etc) is dependent on the level of battlefield support in favour of the armour. Walker Artillery sacrifices speed and agility for durability and long-range firepower, their legs enabling them to negotiate fairly broken terrain more easily than tracked or wheeled vehicles. A favoured tactic of those deploying Walker Artillery is to drop them from the air or space onto the flatter tops of mountains or ridges, where the high vantage point works to the unit's favour both in offence and defence. Since the 22nd century, Terran civilisation has spread out from Earth in the Solar system to inhabit worlds around other stars, in some cases transforming them into places more hospitable to humanoid life. The motivations for doing so have varied - the propaganda value of making the first successful attempt, a realisation that keeping all one's eggs in one basket is a bad move in an indifferent universe, the opening up of new markets and products for dwindling capitalist economies, and lately, a desire not to be caught in a vulnerable position should the CyberShadow make their return to known space. 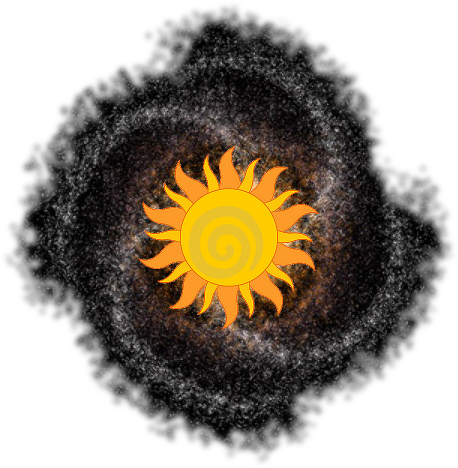 By about 3000 CE this meant that there were a number of star systems surrounding Sol which had been inhabited by Terran-derived civilisations for several centuries, with populations in the billions, a highly developed orbital and spaceborne infrastructure within the star systems in question, and reliable transportation and communications between both each other and with Sol. Although still limited to light speed or slower by the time the 31st century rolled around, torchships at this point in time had been a mature technology for at least 800 years or so, meaning that the Core Worlds had slow but constant interstellar traffic between them. Meanwhile, titanic focused laser arrays in each star system formed the backbone of a light speed communications network transmitting trillions of terabytes of data per second. While it might have taken years for a ship or a signal to reach its destination, the overall effect of this sluggish but dense and constant communication and transportation meant that the Core Worlds were able to retain a common political and cultural identity despite the light years of distance. Also known as Terra, this the Homeworld of Humanity, the cradle of Terran civilisation, the birthplace of Homo sapiens. While hallowed by time and tradition, and of significant symbolic value to many, the influence of Earth on the world stage has diminished slowly but greatly since Terrans took to the stars. Although the political clout of Terra is not what it once was, culturally and philosophically the homeworld's presence can be felt to some degree throughout all of known space. Terraformed in the early 22nd century, Mars was the first world to be transformed in this manner by Terran civilisation. Yet this planetary metamorphosis evokes echoes of a time billions of years ago when Mars had a thriving biosphere and a nascent civilisation, their existence cut short by nuclear war and natural disasters. 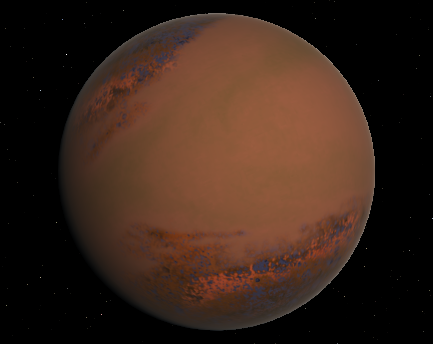 The first extrasolar planet to be colonised by Terrans, Tsuwa is a tidally-locked world that constantly keeps one side facing its stellar parent. The night side is covered in a thick layer of glacial ice, while large part of the land on the day side is dominated by deserts and harsh scrubland. 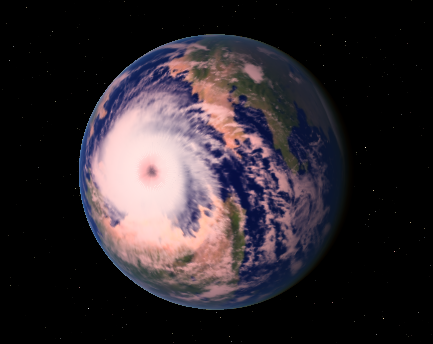 A permanent cyclonic storm dominates the central portion of the day side, constantly whipping off smaller tempests that form part of the planet's unique climatology. 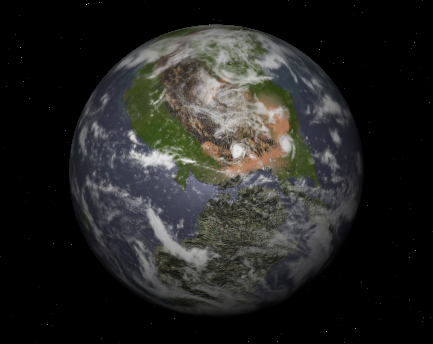 Another tidally-locked planet, Bester was the second planet to be colonised during the first wave of extrasolar colonisation that occurred in the 22nd century. The relative lack of surface water as compared to Tsuwa means that the meteorology on this planet is more sedate, but in contrast to Tsuwa the geography is much harsher - the glacial night side is rugged and mountainous, the day side dominated by the vast and barren Noon Desert. 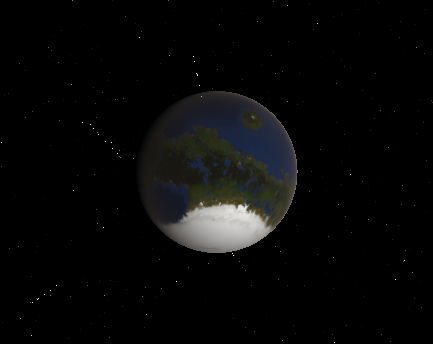 The planet Mephisto was the first extrasolar example to be terraformed. This was no easy task for a new colony to achieve, but Mephisto was made sufficiently habitable for an unmodified human to walk on its surface without environmental protection. 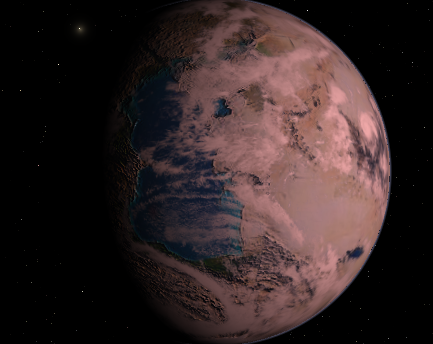 Despite orbiting a very dim brown dwarf star, the high proportions of carbon dioxide making up the planet's still-dense post-terraformation atmosphere creates a greenhouse effect is powerful enough to retain significant heat, resulting in a hot and dusty world by Earth standards, and a thick cloud band composed of water vapour and dust obscures all but the polar regions. 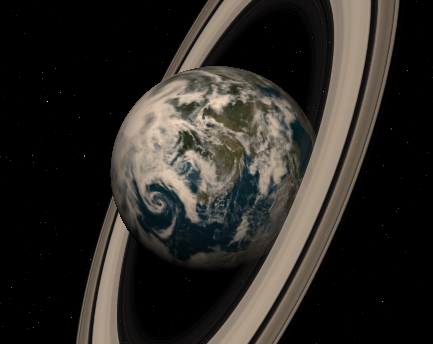 Another homeworld, this time the birthplace of Ghellhonian civilisation, this was the first extrasolar planet discovered by Terrans to have a native intelligent species. Despite being at least three centuries behind Terran civilisation at the time of First Contact, the Ghellhonians went on to play a major role in Terran politics and culture, bringing a swathe of new and fresh perspectives to the various but somewhat jaded palates of Terra. 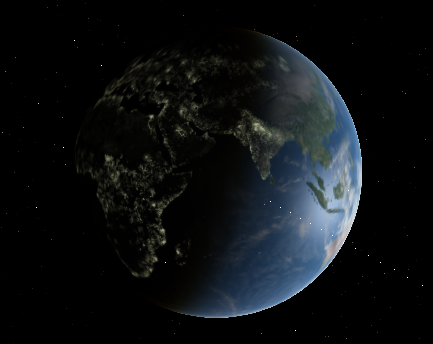 Despite its smaller size and high degree of tectonic activity, the planet Baahki has the largest proportion of natural biomass of all the Core Worlds, its oceans bursting with native life of all kinds and it continents home to vast areas of its unique tangleforest biome. It has a ring system composed primarily of rock dust and small silicate asteroids, which is being constantly maintained and replenished by the vigorous volcanic activity of the larger of its two moons. The planet's rich biological resources have brought forth a great many discoveries in the fields of biology, medicine, and biological enhancement. Wow, Baakhi and Earth have become quite... crowded. Red Commissar wrote: Wow, Baakhi and Earth have become quite... crowded. That was an oversight on my part. I forget to put in the correct information for Baahki when I cut+pasted the formatting. It's been corrected now. A heavily armed craft for its size, and very capable against pirate craft and latter-21st century combat vessels, but lacking punch against warships built to the standards of space forces in the latter half of the 22nd century. Despite this its durable and reliable design ensures this warship is in production throughout the 22nd century. Transit Horizon: The boundary that defines the border between the "inside" and the "outside" of a spherical wormhole. Objects wholly within the Transit Horizon of a wormhole will be carried along if one or both of the wormhole mouths* is moved, likely with some interesting space-time effects for the object(s) carried. Hellburner - Anti-planetary weapon, designed to consume entire planetary atmospheres in fire with a partly self-sustaining nucleonic chain reaction. 20-Z Device - Also known as the Omega Bomb, this is a weapon with enough explosive power (20 Zettatons, hence the name) to blow up an Earth-sized planet, reducing it to gravel flying out of the planet's former orbit. Iron Sun Imperium - Token "Evil" faction? Shadow Network - Secretive and anarchistic anti-AI types, they like hacking/cybertech. Mistrustful of big AIs. The Hedonic League - A cheerfully laid-back culture with a predeliction for leisure, pleasure and play. The Godbuilder Sodality - Terrans who revere AIs as divine, and consider building them to be a sacrament. Biotopian Commonwealth - Use biotechnology almost exclusively, very good at building ecosystems, favour dyson trees and have fleets of treeships and bioships. The Omega Conspiracy - a reputed secret society said to span the entirety of Terran space. Generally considered apocryphal. Heralds of Aquarius - New Age hippies IN SPACE! Nomadic? Zetetic Concordiat - A civilisation of scientists and engineers of all phenotypes. Mindforge - Dedicated to psyonics. Council of Terramagus - An alliance of Terran-derived magic users. Eden Society - Avid collectors, builders and preservers of ecosystems, but they take a more naturalistic approach to it than the Biotopians. Spacer Confederation - A civilisation based on starships and mobile habitats. Outgrowth of the Spacing Guild? Cytherean Alliance - In the 22nd century, a clade of Venus-adapted transhumans suffered various indignities when their newly adopted home planet was invaded and forcibly terraformed by the Pan-Asian Federation. Although the terraformation of the planet was halted, the Pan-Asian invaders driven off by an alliance of Solar polities and they were thus liberated, the events generated much soul-searching among the clade. In 2148, in light of several new colonisations of Venus by Earth-based powers, the Cytherean clade decided to make a new home elsewhere, far from the predations of Terran imperialism. So they constructed an interstellar colonising torchship, the star Gliese 411/Lalande 21185 as their destination. Tri-Galactic League vs Starchitects? Harvesters? The Terrans re-settle an alien race who lost their homeworld on a portion of an Alderson Disk, which has an inner layer of stabilised neutronium to produce a gravitational field. However, when the aliens dig deep into the surface of the disk and reach the neutronium layer, a tree-like entity starts growing out of the neutronium, spreading up and out and causing significant devastation. It transpires however that the neutronium layer was colonised by a intelligent species which evolved on a neutron star, and who became stranded in the structure of the alderson disk, until the refugee's digging gave them a potential escape opening. The 1st/2nd/3rd/4th/5th/6th/7th(8th/9th) Berzerker War - the Berzerkers are autowars left behind by extinct civilisations, which are often "tripped" by exploration of the dead worlds they inhabit. Harvesters - An ancient and enigmatic horde of alien locusts who have swept through the galaxy at least twice, maybe three times in its history, destroying nearly all interstellar civilisations, while causing the rest to regress back to a pre-spaceflight state. Harvester manifestations are classified according to two or three "Waves", geologically brief periods (roughly 100,000 years) during galactic history in which evidence says the Harvesters were actively wiping out starfaring civilisations. According to the Galactic Archive, Harvester artifacts have been discovered that date from at least 1.2 billion years in the past, but none more recent than that. The precise fate of the Harvesters is unknown, but the extreme sparsity of archeological evidence between Wave One (the most recent) and Wave Two suggests the possibility that they employ a very deep and subtle dormancy. Evidence for the earliest Wave Three is sparse, and disputed by some. The Waves are roughly 3.3 billion years apart, which has led to much speculation and investigation of the prospect of an imminent "Wave Zero". While Berzerkers are localised threats capable of endangering smaller interstellar civilisations, the Harvesters are capable of wiping out pan-galactic powers like the former Gardeners. This makes the question of whether or not the Harvesters still exist one of the greatest of the galactic age. What precious few historical records that have survived Deep Time and yet remain comprehensible paint a very grim picture of the Harvesters themselves. As well as being able to appear in vast numbers before disappearing, Harvesters are recorded as being highly adaptable to threats and countermeasures, possessing techno-organic bodies in which the distinction between biology and artifice is meaningless. The Harvesters display a great problem-solving capability, yet the Galactic Archive is entirely unambiguous in stating, again and again, that they have no personality or culture to speak of, and any and all attempts at diplomacy or negotiation are completely ignored. The Gardeners - Ancient precursors who left behind many habitable planets and technological artefacts. 3.3 billion years ago, not long after they had achieved their zenith as the pre-eminent pan-galactic power of note, their civilisation was destroyed by the Wave One Harvesters along with those of the other spacefaring cultures of the time. There has been much debate by xenologists over the nature of the Starchitects. While it is almost universally agreed that their civilisation is at least as old as the universe itself, the question of what a Starchitect actually is can be somewhat contentious. Some xenologists maintain that the vast be-tentacled bioship-like creatures found tending the cosmic engines in the centre of nearly every major galaxy are merely spacecraft, while others insist that said creatures are in fact the Starchitects themselves. Still more advance the idea that the difference between the Starchitects and their biotechnology has become non-existent with the great age of their kind. These bioships, or Starchitects, or whatever they may be, can range in size from 100 to 1000 kilometres, including tentacles. Although typically found in galactic cores, there have been confirmed reports of these Starchitects operating in other parts of galaxies, as well as hints that they can be found in the depths of intergalactic space. What is known about them is derived mostly from observations of their activities in the Galactic core; the Starchitects in that volume of space have been observed building, repairing and maintaining clearly artificial megastructures for largely unknown purposes, hence their name. They have been observed consuming asteroids, comets and similar bodies while excreting refined and manufactured materials. The Starchitects also have the ability to consume entire planets and stars, although this is typically a group effort. One xenological expedition to the Core brought back evidence that a crowd of Starchitects could consume and process a volume of material equivalent to an entire star system in a matter of weeks. They are no slouches when it comes to movement either; the Starchitects have the ability to bend space-time around them in order to facilitate movement, including superluminal warp velocities and the inbuilt ability to jump to and from hyperspace. As well as the primary 100-1000km bodies, there have also been observed smaller bioships/organisms that may constitute a host of smaller starships, symbiotes, crew, or all of the above/none of the above. Observations of Fang attacks on Starchitect holdings and artifacts reveal that without a doubt they are capable of FTL sensing, and have also in those same incidents demonstrated more than enough power even as individuals to effortlessly crush entire fleets from any other major galactic power. Various attempts by Terrans to establish peaceful contact have been universally ignored, and given the robust nature of the Starchitects' work and their massive bulk which reduces most starships to tiny specks, it is highly advisable not to get too close. While they have never shown overt hostility apart from in self-defense, they also display a certain disregard for the effects of their activities on lesser species, making their self-imposed confinement to the cores of galaxies and other select volumes a welcome one for most. Indeed, it takes quite considerable effort and expenditure of energy for an attack to even get noticed by a Starchitect, rather than just being dealt with by the equivalent of a Starchitect's automated defenses or immune system. The Fang Empire once expended six entire fleets attempting to capture/kill a juvenile Starchitect, and a Terran observation post several light years away noted that the Starchitect only reacted when the final three fleets all attacked at once. Those three fleets were wiped out far more quickly than the previous one and two had been by the Starchitect's sub-organisms. While the Starchitects appear to be able to live quite comfortably in the vacuum of space, they also construct titanic dyson sphere-sized spherical habitats which have so far proven to be impenetrable by Terran xenologists. The Sublimated - Those civilisations that advance to such a degree and/or at such a pace that the density of information causes them to disappear from the universe from the viewpoint of less developed civilisations. The discovery of Sublimated civilisations has thus turned out to form part of the answer to the Fermi Paradox. Depending on the nature and circumstances of the Sublimation event, it can occur in single individuals all the way through to entire civilisations. Sublimated civilisations often leave behind a fair amount of relics, which the Sublimated may or may not still have an interest in, and/or which they can be protecting in some way. The name for these superlative entities is derived from that of a phase transition of a substance from a solid to a gas. The Sublimation process is often abstracted as the "rubber sheet" model of how information systems organised into complex self-modifying patterns leave an impression on the universe. In this model something on the scale of a human mind is akin to a small steel ball bearing in place on a stretched rubber sheet representing four-dimensional spacetime, which impresses only the smallest of dents on the surface. However, a large bowling ball (representing a large-scale AI or somesuch) or a whole pile of steel ball bearings (representing a civilisation composed of human-scale individuals) leaves quite a bigger impression. It is this localised bending of spacetime which is believed to facilitate the ability of trained and disciplined minds to acquire psyonic abilities. Extending this analogy then, Sublimation could be considered the equivalent of a sufficiently large, heavy and/or dense ball (or a collection of same) on the rubber sheet becoming massive enough to pierce and fall through the rubber sheet. When this happens, the intelligence or collection of intelligences appears to disappear from the universe as humans typically perceive it. There are some species and civilisations who worship or venerate Sublimated entities. These theological relationships are varied and idiosyncratic, with the Sublimated in question playing an enthusiastic, indifferent or even hostile role towards such supplicants. One consistent pattern has emerged, however; species and civilisations which imbue the Sublimated with any socially significant value don't go into empire-building on a significant galactic scale. This consistent and significant reluctance on the part of Sublimated entities to interact much with the greater universe has drawn comment and enquiry among Terran minds. With the discovery of the Harvesters among other things, this has hardened into suspicion in some quarters. It is known that psyonic abilities were made possible by Starchitect tinkering with the fundamental physical workings of the universe billions of years ago, apparently as a countermeasure against the Harvesters, which had become a nuisance upon making their first major appearance in the universe. But this modification to universal physics had a side-effect, one that was most likely not intended on the part of the Starchitects. It placed an upper limit on how massive/dense a complex informational system could be while remaining anchored in the familiar four dimensions of spacetime. This effectively created the necessary conditions for Sublimation events to occur, and galactic historians believe that Milky Way would have been a very different place, teeming with advanced cultures unified into pan-galactic community of civilisations. An exo-political playing field which very much disfavours the Harvesters. Is Sublimation a Harvester counter-countermeasure? Or is it merely an incidental side-effect? Angels: Aloof, paternalistic superbeings who see it as their mission to guide and instruct those they see as "lesser" beings. Daemons: Social-darwinistic, sociopathic superbeings who believe that might makes right and who like their Angelic rivals are highly evangelistic about their worldview. Things: AKA Eldritch Abominations, these entities are powerful indeed but lack the long-term focus of Angels and Daemons (...usually! ), although they can be very cunning in the short term. Their motives tend towards the animalistic - eat, fight for territory, reproduce. These entities are the most likely to actually predate the Harvesters, due to either sheer power or being sealed up somewhere. The Fae and Daemons both have an aversion to iron, indicating a possible common ancestry or some other relation. Considering the reputed age of Daemons, perhaps the Fey are a latter-period offshoot of them, having seperated for political/cultural/aesthetic reasons; the Fair Folk being more interested in hedonism than enforcing the law of the jungle. You mention "magic". Is this really some form of advanced technology that makes the effects look magical or is it really more esoteric? I guess is the magic here merely Clarke's Law tech or is it something that's physics defying? wellis wrote: You mention "magic". Is this really some form of advanced technology that makes the effects look magical or is it really more esoteric? I guess is the magic here merely Clarke's Law tech or is it something that's physics defying? Depends on how you look at it. The Grimoire of Irkutsk was the first magical object discovered by Terrans, even if they didn't quite realise it at the time. In time the Terrans will come across larger artifacts, such as Mana Generators which when active create a standing thaumological field. Also, this article comparing thaumology (magic) with psyonics (written from an OOU perspective) should hopefully go some way towards explaining things. As it was written a while back there may be come inconsistencies. For example, in the linked article I describe EAs as concocting "convoluted scheme", which would seem to conflict with my later description above of EAs/Things not being all that great at long-term planning. Maybe it's the exceptional ones that are responsible? If there is ever a game like this, I'm definitely taking either the Orion Federation, the United Republic of Nova Terra, or the Iron Sun Imperium. I always seemed to relate more to the preservationists alot more for some odd reason; Perhaps it's because I'm a bit of a luddite (still refuse to get a smartphone). That being said, I'm definitely not like the Watchmen. When do you think we would have a game like this? NoXion are we going to see any stories during the later eras? The RPG stuff is interesting but you also have this grand era of interstellar exploration and the massive conflict between the Terrans and the Fang. Will we ever get to see anything about that? For instance what is Fang ground warfare like in the era they and the Terrans encounter each other? Heretic wrote: If there is ever a game like this, I'm definitely taking either the Orion Federation, the United Republic of Nova Terra, or the Iron Sun Imperium. I always seemed to relate more to the preservationists alot more for some odd reason; Perhaps it's because I'm a bit of a luddite (still refuse to get a smartphone). That being said, I'm definitely not like the Watchmen. One of the key themes I'm trying to emphasis in the setting of Nova Mundi is that the universe is a big enough place to hold many different varieties of interstellar society. The size of the universe also means that there's always a bigger fish out there, and thus despite the differences it's a damn good idea for cultures and civilisations with a common history to work together (or at least not tread on each others' toes too much), especially in the face of mutual adversity. Glad to see you're interested, despite what must be exasperating procrastination on my part with the current game! If I can come up with a decent galactic map, then I think we could have a game kind of like the current one except on a larger scale. I'm terrible with timetables and my "creative" impulses seem to come and go of their own accord, so I honestly couldn't tell you when. But when the current game is over I'll have a lot of energy to spare for such an endeavour. wellis wrote: NoXion are we going to see any stories during the later eras? The RPG stuff is interesting but you also have this grand era of interstellar exploration and the massive conflict between the Terrans and the Fang. Will we ever get to see anything about that? For instance what is Fang ground warfare like in the era they and the Terrans encounter each other? I wouldn't mind doing something more focused on exploration and interstellar conflict on a massive scale, especially since I'm beginning to get a more detailed picture of the overall galactic setup, and if it proves to be more interesting to people here than a more character-focused RPG then I might as well do just that. As for Fang ground warfare, I'm mostly undecided apart from having some kind of soldier/warrior dichotomy kind of thing going on, reflecting the wider Fang political duality of Statist/Monarchist. I haven't posted any of my random graphical crap up here in a while. Let's fix that. Not sure if I got the ratios right. I wanted to keep it simple. Author name is a pseudonym. Base image used is "Alien landscape" by Andree Wallin. Ooh! Is this an in-universe novel or your own? It's a book cover for an imaginary novel in real life. Which sounds really strange when I put it like that.